During Saturday’s unanimous decision victory over Glover Teixeira at UFC 172, reigning light heavyweight king Jon Jones (pictured) was issued a verbal warning by referee Dan Miragliotta for keeping his fingers open when reaching out to keep Teixeira at bay. It appeared as though Jones poked the Brazilian in the eyes with his fingers on at least two separate occasions. 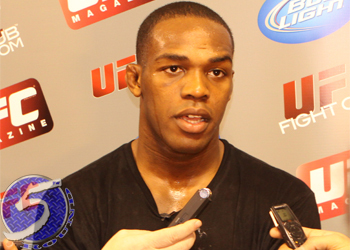 While Jones wasn’t deducted any points for his infractions, the assumed unintentional strike did catch the attention of fans and UFC president Dana White. Jones, who is the UFC’s most decorated 205-pound champion but is also arguably the company’s most disliked title holder, took to his official Instagram account to mockingly address his detractors. “Jones put his finger in his eye. Dirtiest fight in MMA,” Jones sobbed while pretending to be a pouting fan. “Bones” must have taken plenty of heat for his sarcastic video, because the 26-year-old deleted it shortly after its release. However, in this Internet-powered world, just because something is erased doesn’t mean it’s gone forever (props to MMA-Core).